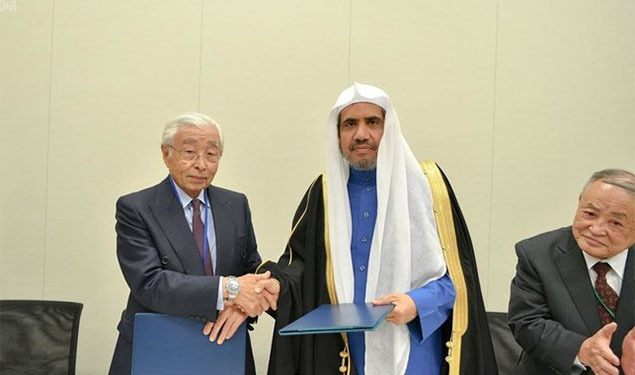 Jeddah: Secretary General of the Muslim World League (MWL) Mohammed Al-Issa, who is also the president of the International Islamic Halal Organization, has made an exclusive distribution agreement with Japan. Under the agreement, MWL will be the exclusive provider in Japan, generally, and in the 2020 Tokyo Olympic Games, particularly, of halal-certified meals. The signing ceremony was attended by Mitsuhiro Miyakoshi, special adviser to the Japanese prime minister, and Prince Hiroyoshi, the cousin of the Emperor, along with a number of representatives of Islamic centers, Japanese authorities and major companies. The agreement grants MWL the right to regulate, in cooperation with the Japanese government, halal foods and services to the highest standards. It will also certify the products and services in accordance with the halal and hygienic standards before they reach the consumers. MWL will also issue halal certification for products designated to Muslim communities in Japan or those to be exported abroad, especially to Arab and Muslim countries. Japan is a new but sharply growing halal market as the country’s producers are seeking fresh opportunity in the halal sector and striving to seek new local and international markets, especially now that Japan is the officially designated venue for the 2020 Olympics, attracting Muslim tourists from all around the world. In his address, Al-Issa stressed the importance of this cooperation between MWL and Japan. And he hailed the highest levels of coexistence, national integration and harmony pervasive across all religions, sects, and races, away from extremism, as well as the human values and ethics deeply instilled within the Japanese people. Meanwhile, Dr. Noka Miyagima, CEO of the NGOs, regarded the signing of this agreement as a historic and empowering event for Japan. He also expressed thanks and appreciation to the numerous social contributions of MWL, wishing further cooperation in the future through the halal project. He also praised the role the League is playing in raising the awareness of Muslim communities in Japan and in the Islamic world, and promoting their integration into non-Muslim communities. Al-Issa participated earlier in a ceremony held to mark the seventh anniversary of the tsunami that hit Sendai city, northern Japan, in 2011 and visited the Sendai School for Orphans, which shelters children who had lost their parents in the tsunami. He also visited, accompanied by members of the League, the Hiroshima Museum, where he examined documents of the atomic bomb dropped on the city.